All our beef biltong is 'Made to Order" using the finest grass-fed Aberdeen Angus Silverside, matured on the bone for extra flavour. Our game biltong is premium Haunch of Scottish Red Deer. Our biltong is hand cut, hand spiced & packed by hand in the only EEC approved kitchen in the UK. 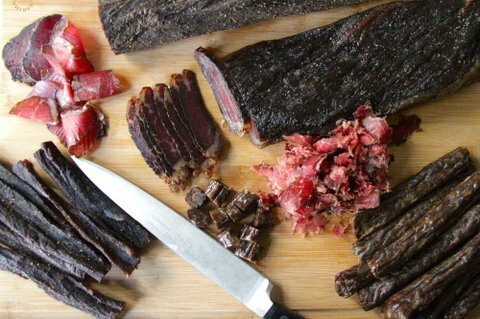 'Made to Order" means that your biltong is the freshest & finest it can possibly be. As we do not have biltong sitting around waiting for an order, dispatch is normally 5 to 6 days after ordering. Royal Mail handles our UK deliveries and DHL delivers to the rest of the world. Biltong is the ideal protein boosting snack for all sports enthusiasts alike, from gym to cyclists, walkers to football players. If you are on the Atkins diet, this is certainly the midday option for a low calorie snack. It's perfect to put in your children's lunch boxes for school or just to nibble on family outings. Biltong is extremely "moreish and addictive" and enjoyed socially by family and friends at every occasion whether it's round the barbeque in summer or watching the footie and rugby with friends over a few pints. Ideal for low carb, low fat & high protein diets - Athletes, sports enthusiasts and body builders - All outdoor pursuits including camping, fishing, hiking, cycling, climbing and many more. Protein: Biltong contains 47.8g of protein per 100g. only contain +-28g of protein per 100g. Fat: Biltong contains 0.96g of FAT per 100g. Nuts contain +-53g of fat per 100g. Calories: `	Biltong contains only 248kcal per 100g. Nuts contain +-600kcal per 100g.